Imagine you're in Disneyland (ok, twist my arm). You've waited 45 minutes in line for your favorite ride, and now you're finally on and having a great time. Then - BAM - ride stops! The lights come up and the music stops just long enough for you to hear an announcement that the ride needs to be shut down and a cast member will be there to assist you shortly. NOOOOOO!!!!! This has happened to me a few times over my many (many, many, many) trips and I actually think it's fun! I've been evacuated off of Indiana Jones and got to walk right under the big rolling boulder. I've been evacuated off of Splash Mountain when I was practically at the top and got to walk down tons of stairs and end up backstage. 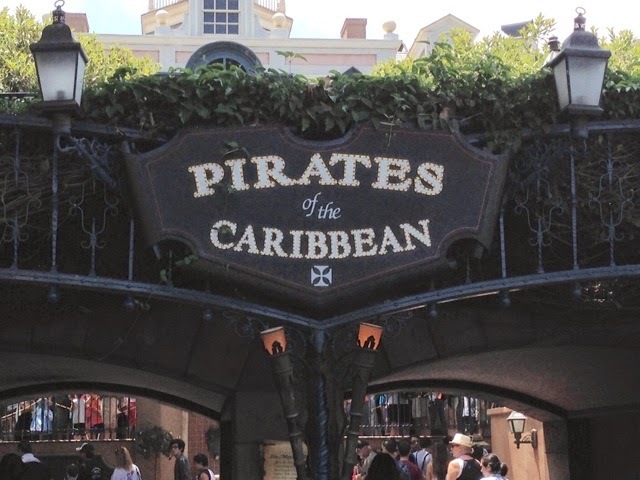 But today I wanted to share the story of my best evacuation - off of the Pirates of the Caribbean! Back in college I lived close enough to Disneyland to go whenever I wanted - and I wanted to go pretty much every Friday. This particular Friday, I went with two friends who had never been before. I was in my glory and so excited to show off my favorite place to newbies! We were having a good time, but I really wanted to get to show them something spectacular. I had no idea what was coming! Our last ride for the night was Pirates. When we got to the big room where the pirates have set the town on fire and are singing their little audio animatronic hearts out, we bumped the boat in front of us. I told my friends it was no big deal - there are always traffic jams on this ride. But it didn't clear up! We were sitting there for quite a while. All of a sudden the music stopped. Just the music. The pirates kept moving, and it was a little weird. That's when we got the announcement that the ride had broken down and we'd need to be helped out. Here's where it gets good. They turned the music back on and, since there was nothing else to do while we waited, everyone started singing along! The whole place was booming with voices that sang the chorus clear as day, but the verses came out sounding like "na na na na na na yo ho!" I've never heard anything like it. I loved every second! Then came the cast members. Apparently we had passed the best evacuation spot and our boat needed to be pushed backward by hand! Cast Members in pirate outfits and rubber overalls came wading through the water and pushed our boat back about 20 feet so we could step out and climb the exit stairs, which I had never even realized were there. By the time all of this was done, the park had long closed. So instead of just taking us to the front of the ride so we could walk out, we were guided by cast members (still Pirates, but no rubber suit) through a path backstage all the way to the main entrance. This was before I was a cast member (I'll save those stories for another day!). I can't even describe how cool it was to see backstage. There were ride vehicles all over the place, half costumed cast members, and trailers for different departments all with cute Mickey signs on their doors. And my friends loved getting the more unusual experience! I've got to tell you...I KNOW I have pictures that document this whole bizarre story, but this was back in 2002 or 2003. Most people didn't have digital cameras, let alone smart phones. I took pictures on a disposable camera and have no idea where they are! (Mom, I think I still have some photo albums at your house.) If I ever find them, I'll be sure to post them! Have a cool ride evacuation story? Share with us!